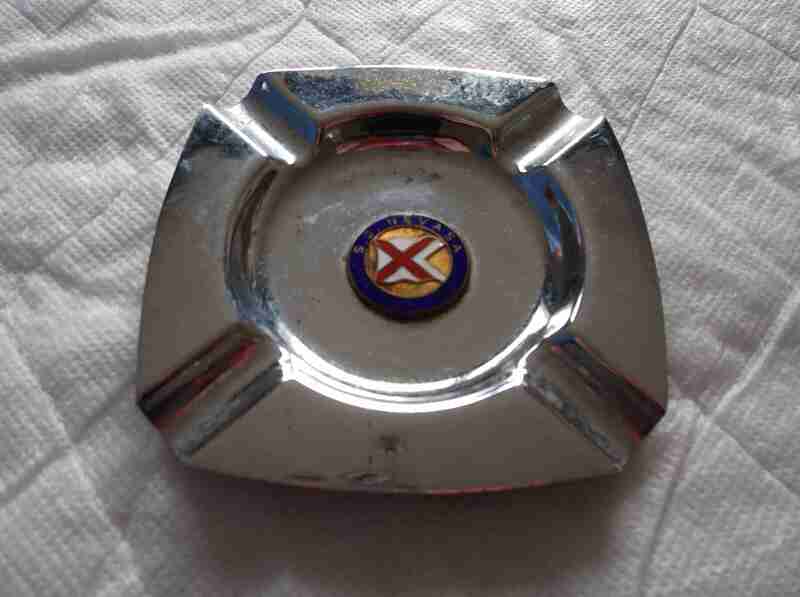 DESCRIPTION -- Souvenir round ashtray from the Chandris Line shipping company which shows the company houseflag in centre and name on side. The size is 5" (13cm) wide and it is dated circa 1960's with the condition being excellent. HISTORY -- Chandris Line was founded by John D. Chandris, from the island of Chios, who bought his first vessel, the sailing ship Dimitrios in 1915. After the First World War, he purchased his three first steamers, Dimitrios II, Vlassios and Eugenia, trading around the Greek islands. Chandris Line entered passenger shipping in 1922 with the steamer Chimara, which ran a coastal service between Piraeus and Corinth. In 1936, he bought his largest ship to date, the 1,306-ton Corte II, built in 1911 for the French company Fraissinet in Newcastle, and renamed her Patris. DESCRIPTION -- Souvenir chrome ashtray from the 1950's and from the B.I.S.N.Co. vessel the SS Nevasa which shows in the centre the company emblem and is in a great condition. HISTORY -- The third Nevasa was built for BI in 1956 as a troopship under government specifications. She was followed by her near sister, the Oxfordshire, built for the Bibby Line in 1957. Unfortunately both ships' careers as troopships were cut short as the result of the government's termination of national service and the increasing transfer of troops by air. Eventually BI took the decision to convert Nevasa for a new role as an educational cruise ship. 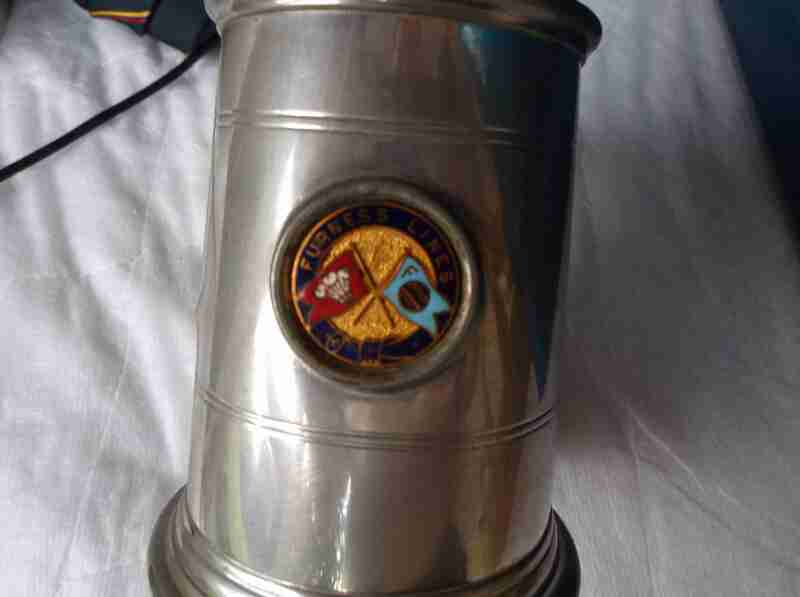 DESCRIPTION -- From the Furness Line this is a souvenir pewter tankard which shows on the front the company houseflag and is 4" (10cm) tall. It is also bottom marked pewter and dates from the 1950's. HISTORY -- The Furness Line, in North West England, runs from Barrow-in-Furness to Ulverston and Grange-over-Sands, connecting with the West Coast Main Line at Carnforth. Along with the Cumbrian Coast Line, which runs north from Barrow to Whitehaven, Workington and Carlisle, it is considered one of the most scenic routes in England. 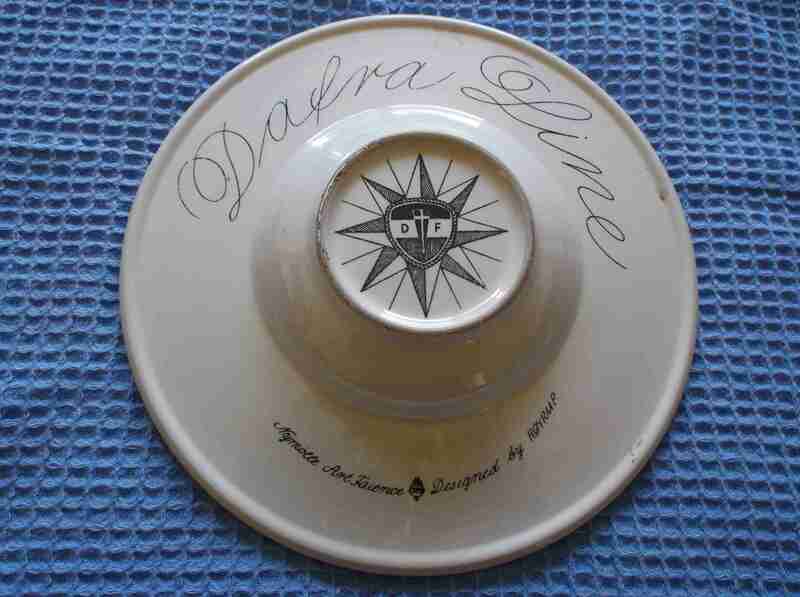 DESCRIPTION -- As used on board items from the Houlder Line shipping company and from the vessel the SS Duquesa. They are a silver-plated fish knife and serving dish which are both in a very good condition. 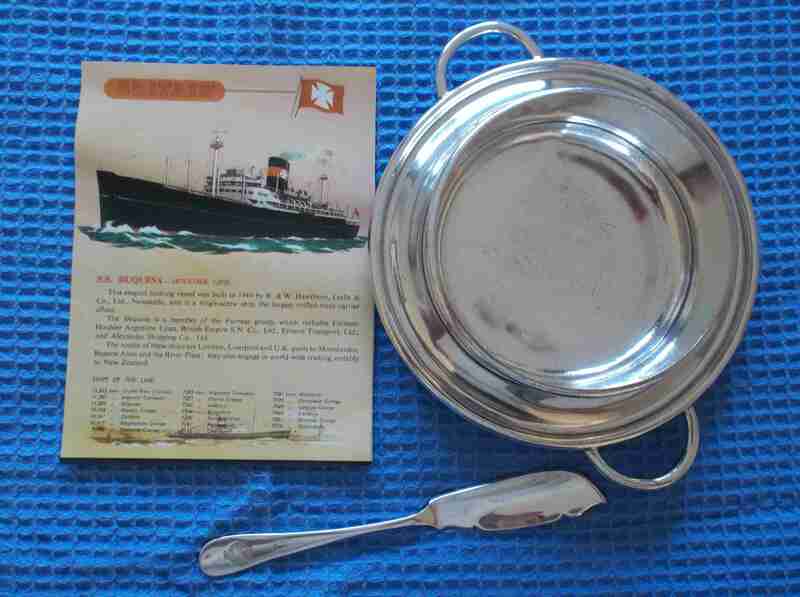 Both items show on them the company logo and there is also a coloured picture of the vessel included which gives details of the ship. HISTORY -- Houlder Line was a number of related British Shipping companies originally established by the Houlder brothers. Houlder Brothers & Co. was formed in London 1856 and operated in the market for chartered tonnage. In 1861 the company acquired the Golden Horn, which they used on the North Atlantic routes to the United States. The company later expanded to service routes to New Zealand, Australia and the Pacific Islands. From 1875 to 1880 the company worked with John T. Arundel & Co. in a guano mining business on Flint Island in the Pacific Ocean. In 1881 the company entered the passenger and cargo trade to the River Plate. 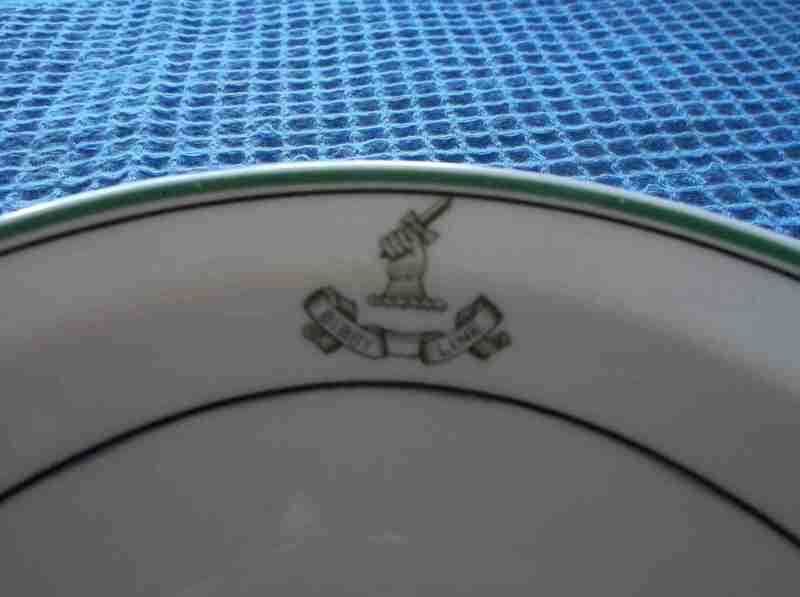 DESCRIPTION -- From the Bibby Line this is an as used on board breakfast cereal bowl with the size as 6" (16cm) wide and produced in the traditional shipping line design colours. It shows on it the company emblem and is circa 1940's and in an excellent condition (click on the picture for a close up view of the company emblem). 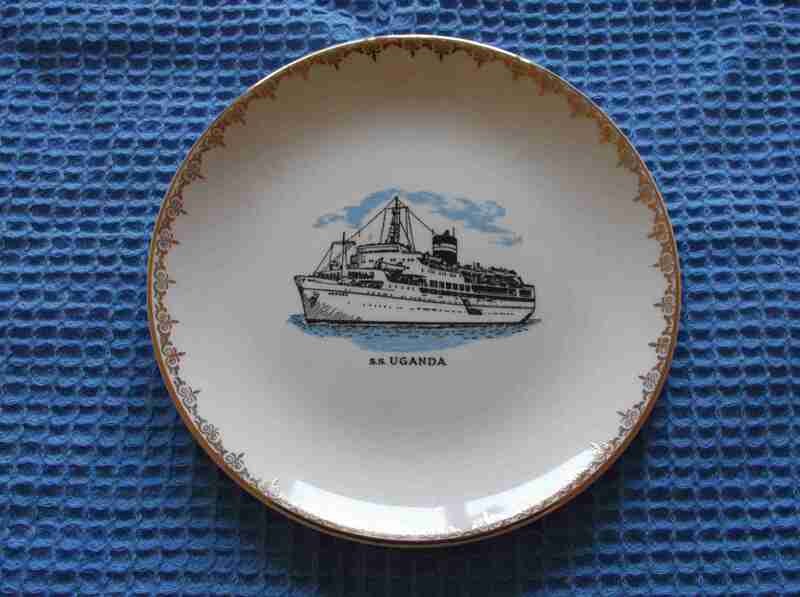 DESCRIPTION -- From the vessel the SS Uganda from the British India Line shipping company this is an early souvenir china plate with the size being 7" (18cm) wide. It shows on it the vessel in the centre with a gold edge to the plate and is circa 1960's. 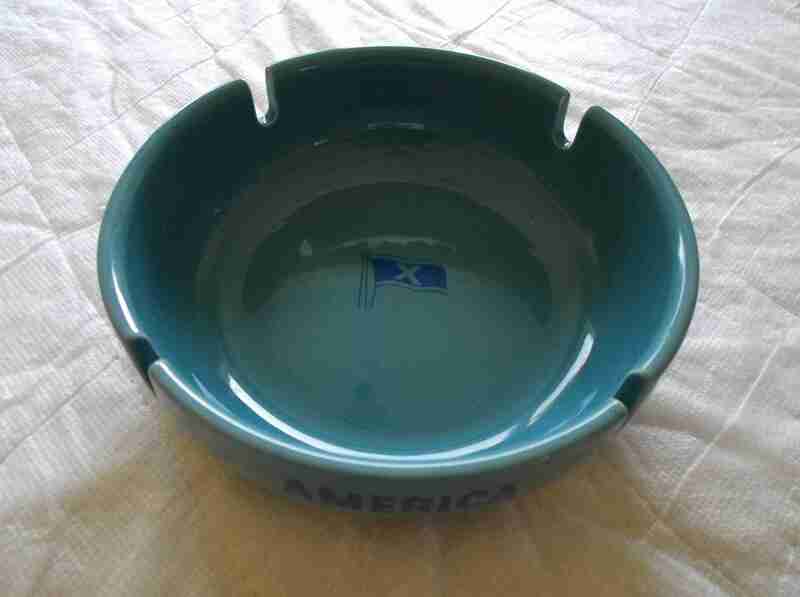 DESCRIPTION -- Souvenir bowl from the Dafra Lines and is circa 1960's and shows a picture of a vessel in the centre and the company houseflag/emblem on the bottom along with the company name. The size is 8" (22cm) and shows on the front the most beautiful markings and design and is in a great condition with not many items seen from this shipping line (click on the picture for a view of the base of the bowl and unusual markings). HISTORY -- Dafra Lines are a shipping company that hail from Copenhagen, Denmark and transport goods throughout much of India and Africa. 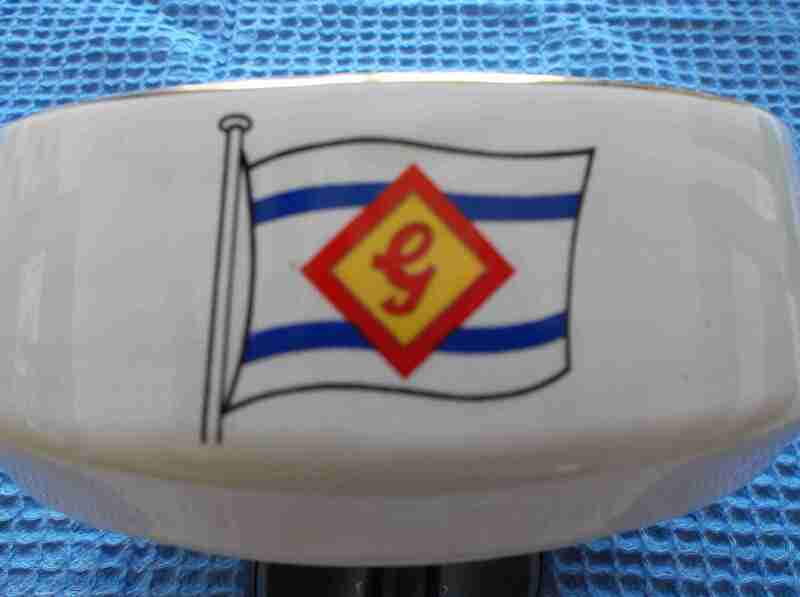 DESCRIPTION -- From the Geest Line shipping company this is a round shaped ashtray which shows on either side the company houseflag emblem and is white in colour. It is dated circa 1960's and in a fantastic condition and the size is 5" (14cm). HISTORY -- Geest Line has fostered trade links between the UK and the Caribbean for more than 60 years and today carries more cargo between Europe and the Windward and Leeward islands than any other shipping line. The origins of the service lie in the shipment of bananas eastbound. Instead of the ships returning in ballast, it provided the perfect opportunity for establishing a general cargo service carrying everything from small packages to large project machinery. 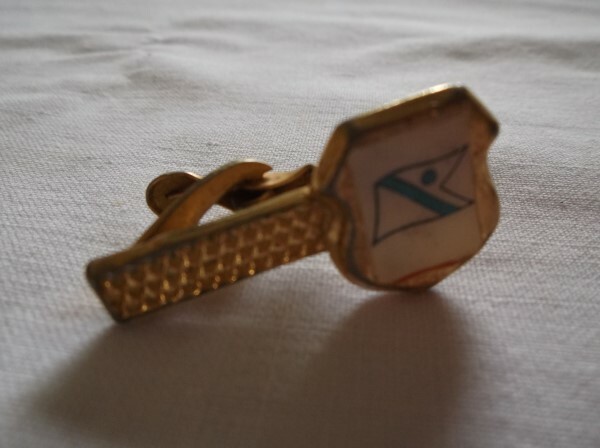 DESCRIPTION -- Early souvenir from the Fred Olsen shipping company which is a tie clip souvenir showing on it the company houseflag. Although not in an excellent condition, this very early souvenir is a great find. HISTORY -- Fred. Olsen & Co. is a shipping company based in Oslo, Norway. Today it is the holding company that controls the Olsen family's interest through Bonheur and Ganger Rolf. The company was founded by Petter Olsen (1821-1899) in 1848 and, by his death, the company had 16 ships with offices in Hvitsten. Petter's son Thomas Fredrik "Fred" Olsen (1857-1933) or Fred Olsen, whom the company is named after, took the company from a small business with a few boats into a powerful multinational shipping and ship building business. HISTORY -- The SS Highland Glen was built by Russell & Co Port Glasgow. The vessel was launched on Saturday, 23rd July 1910 and was from the Nelson Line. It is from the vessel The Highland Glena superb ship. She was a passenger/cargo ship owned and run by the Nelson Line. The vessel was broken up at Hendrik Ido Ambacht following serious fire damage in East India Dock, London on 20 Nov 1933.